Gloria Golf Resort enjoys a stunning location at the foot of the Taurus Mountains, where guests can enjoy a tranquil holiday surrounded by lush pine forests. Select from exquisite bright and contemporary rooms, suites and villas with garden or sea view available. Fairway fans will delight in two 18-hole and one 9-hole golf courses, while younger guests will be entertained by the onsite Kids Clubs. 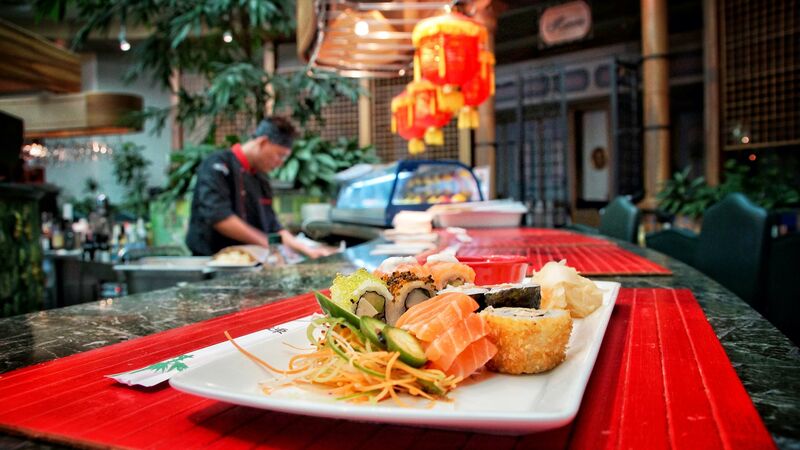 An array of restaurants and bars await; featuring cuisine from around the world with a modern twist. There is a choice of swimming pools and an Aqua Park with rides and slides to keep the whole family entertained. Should you wish to relax and unwind, make sure to sample the treatments and massages available at La Source Spa or take in the incredible sea views from the Blue Flag Gloria Golf Resort Beach. There is also a fitness centre and a fine assortment of leisure activities available - from parasailing and water skiing to football and yoga. The hotel has 515 rooms. Buffet breakfast, lunch and dinner. Selected drinks. 3 Snack option for lunch (during summer season). 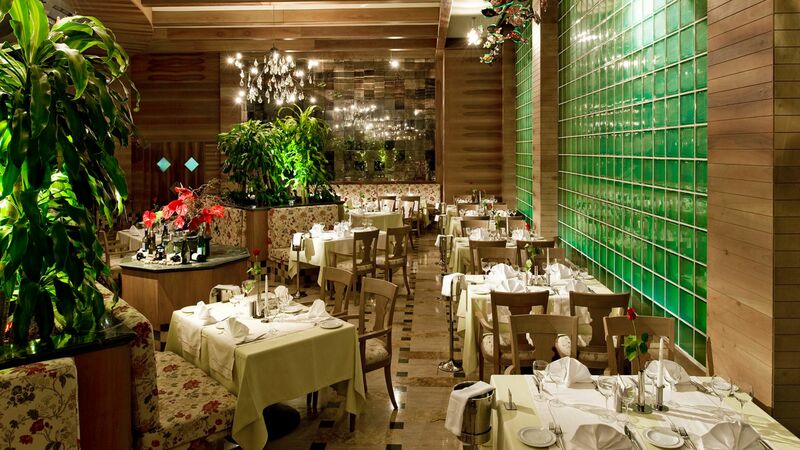 One meal per week in Pescado, L'Ancora and Harem à la carte restaurants (reservations required). Ice cream at specified times. Selected drinks. Minibar replenished daily. Tennis courts. Fitness centre. Children's club for ages 4-12 years. Entertainment. 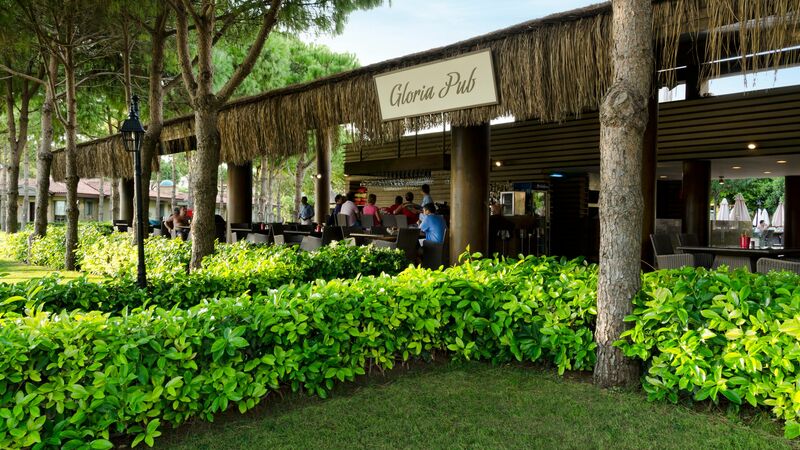 Please Note: The Gloria Golf Club is not included in the all inclusive rates. 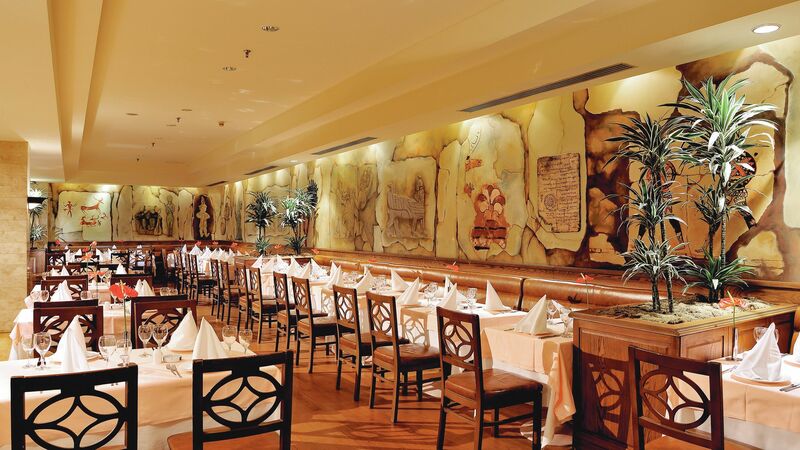 Enjoy Turkish and international favourites, including themed buffets within an authentic Turkish dining room. Relish in al fresco dining as you sample mouth watering seafood and meats and take in exquisite river views or watch the mesmerising sunset. Drinks are available all day. Open: 12:00 – 17:00 (food and snacks), 09:00 – 19:00 (drinks). Located at the heart of the family site swimming pool, guests can cool off with a refreshing drink or a light snack without straying too far from the water. Open: 12:00 – 16:00 (snacks) and 09:00 – 18:30 (drinks). 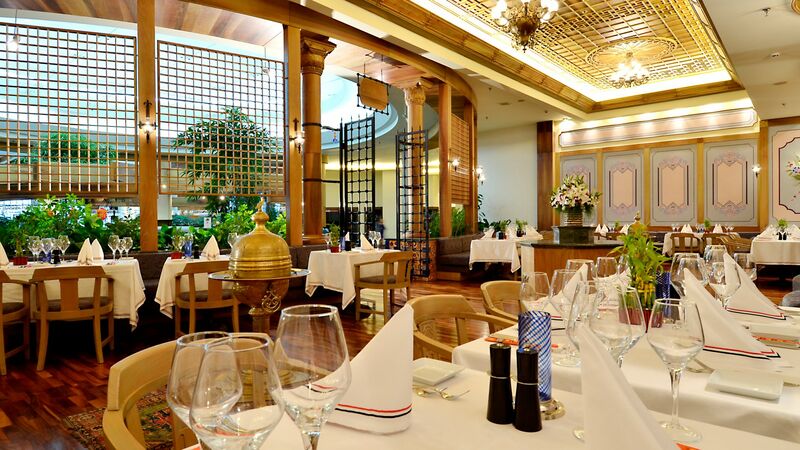 Take in the Ottoman inspired interior décor as you dine on fine international cuisine from around the globe. 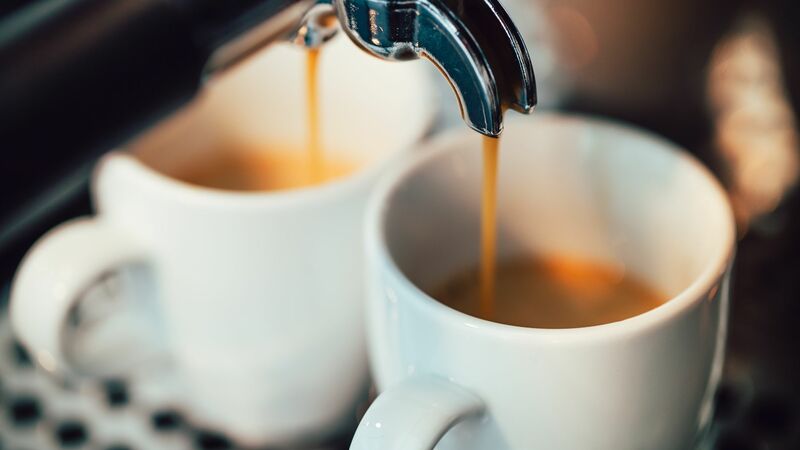 Sample exquisite a la carte Italian cuisine presentations from within a stylish dining room or dine al fresco on the terrace which overlooks the tropical gardens. 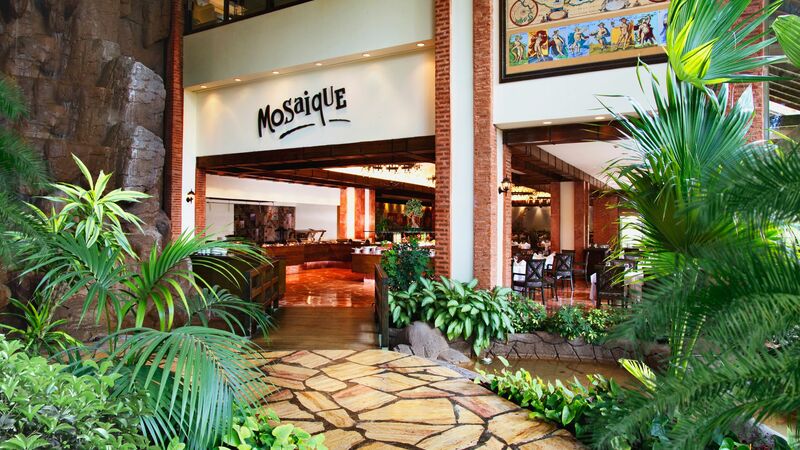 Mosaique features international cuisine and themed dinners while offering unique and stylish interior design. Open: 08:00 – 10:00, 12:30 – 14:30 and 19:00 – 21:30. Sample mouth watering a la carte seafood for dinner, from within a unique and elegantly decorated restaurant. 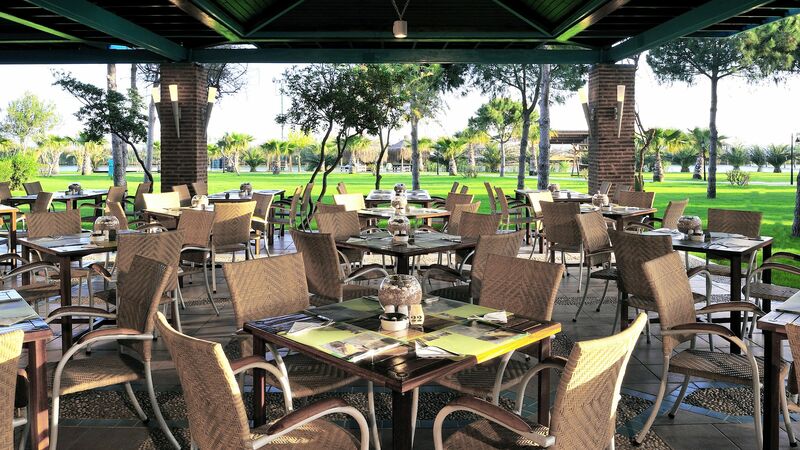 Open for lunch during summer, guests can enjoy outstanding Turkish cuisine created by Gloria Golf Resort’s talented chefs and served on the terrace overlooking the gardens. Open: 12:00 – 16:00 (summer, closed in winter). Sample Japan’s finest sushi created by the hotel’s masterful chefs into intricate artistry, accompanied by a fine collection of spirits and beers, within traditional surroundings. Open: 18:00 – 21:00 (closed Wednesdays). 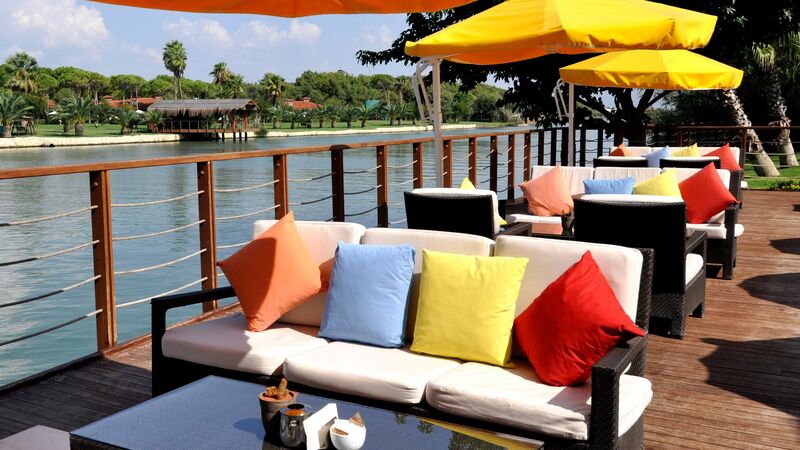 Sample snacks, light bites or sip a signature cocktail overlooking the river and gardens. Open: pub 09:00 – 00:00, lunch 12:00 – 16:00. 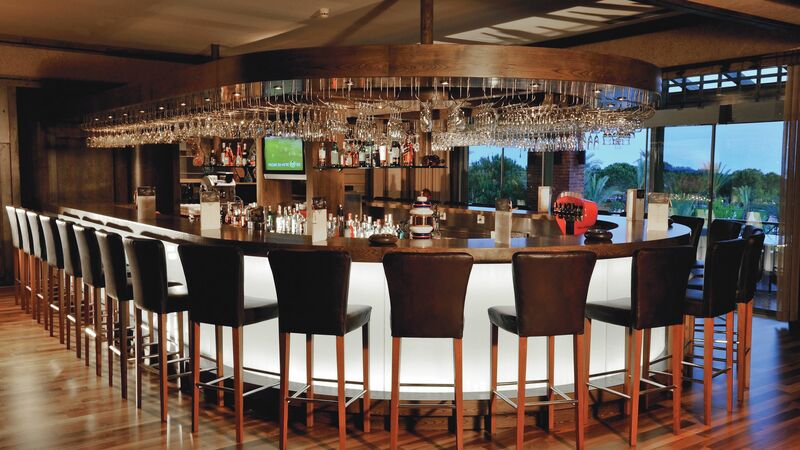 Catch up on the daily news or enjoy a welcome cocktail or pre-dinner drink, accompanied by live music. 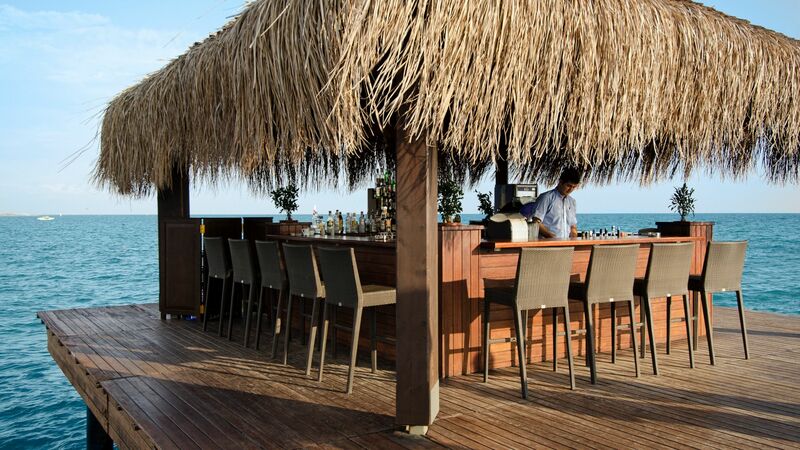 Sit at the end of the pier looking out to sea with a cool drink accompanied by a chilled out atmosphere. 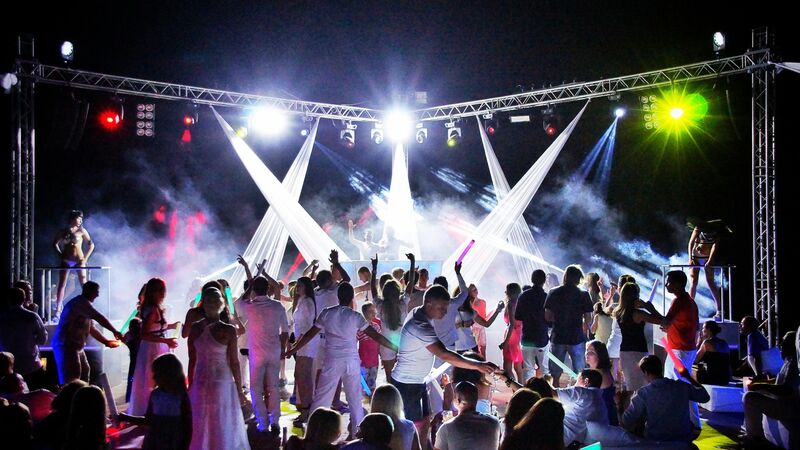 Dance the night away with world famous guest DJs in this outdoor party zone, which is tucked between the sea and the river. 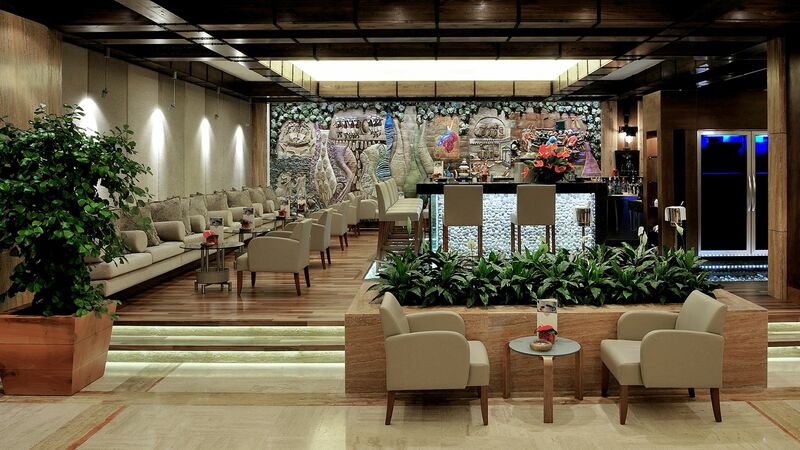 Sip on a signature cocktail or relax with a coffee in a chic piano bar. Treat yourself to freshly made cakes, homemade cookies and delicious macaroons - a must for those with a sweet tooth. Enjoy live music and the latest sport action as you sit with a refreshing drink in a modern and stylish bar looking out over the gardens. Choose from nine swimming pools, including two dedicated children’s pools, a family pool, indoor pools and a selection of outdoor swimming pools in the exotic gardens area. Guests can also enjoy their very own aqua park, with slides and activities for the whole family. 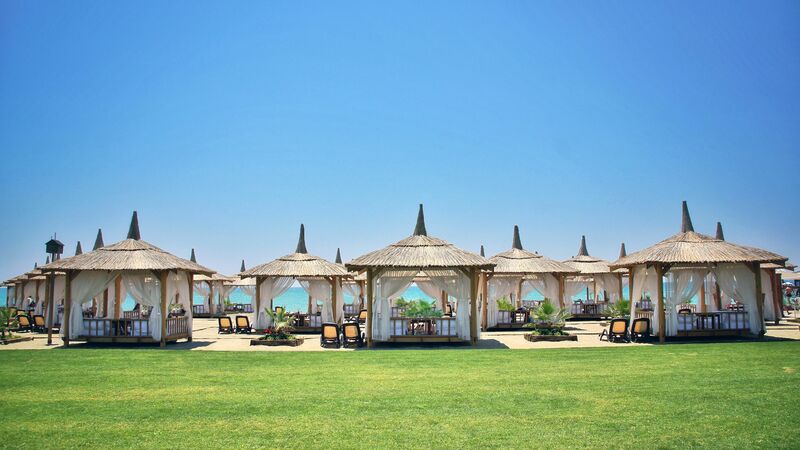 Relax in deluxe outdoor pavilions as you soak up the Turkish sunshine, from the comfort of the golden sands of this Blue Flag beach. Guests can also enjoy swimming and snorkelling in the warm, azure waters. 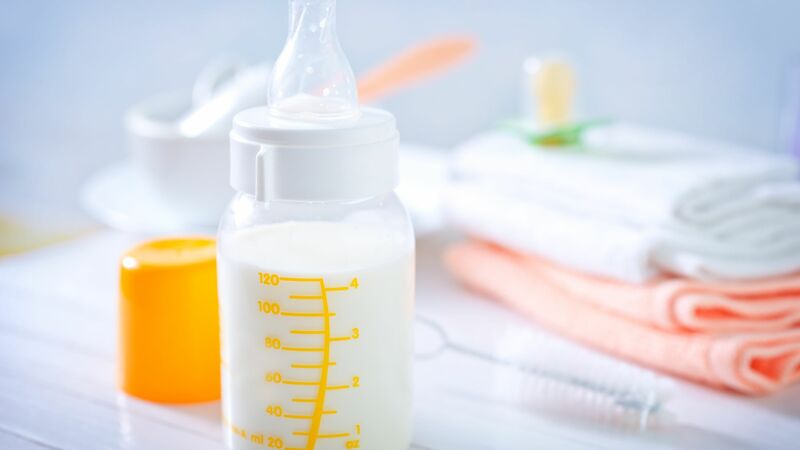 Take advantage of the hotel’s babysitting service, in addition to a baby kitchen for preparing meals, baby monitors, baby strollers and an activity centre suitable for one to three years. Open: 09:00 – 02:00 (summer) and 10:00 – 21:00 (winter). Pre-booking 24 hours in advance is recommended. English speaking staff will supervise your four to seven year olds as they take on treasure hunts, trampolining, nature trails, sports and a mini disco. Ages: 4 to 7 years. Eight to 12 year olds can try out mini golf, water sports, trips to the Aqua Park, a cinema and table tennis under the watchful eye of expert English speaking staff. 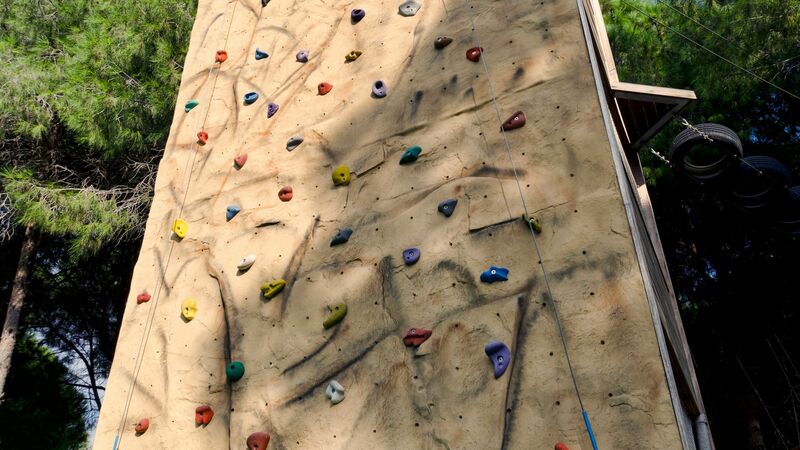 13 to 17 year olds can partake in water sports, mini golf, DJ courses, swimming, volleyball and much more in their own dedicated teenager area. Open: 11:00 – 12:30, 14:30 – 17:00 and 19:30 – 22:30. 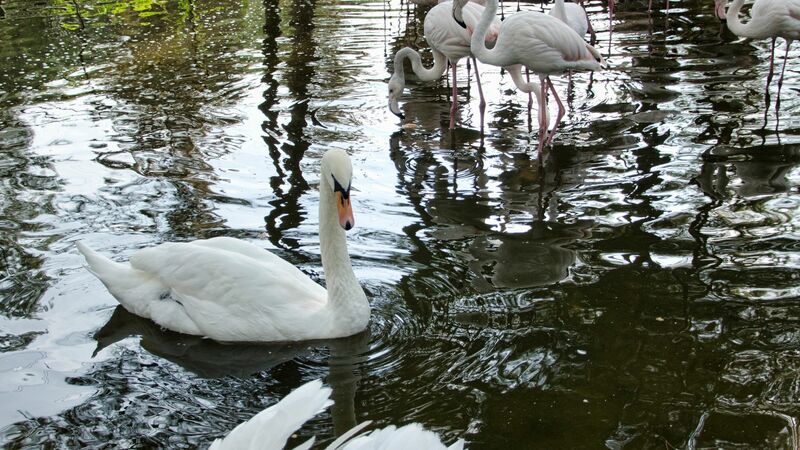 Meet and greet the local ponies, flamingos and goats at Gloria Golf Resort’s very own mini farm. 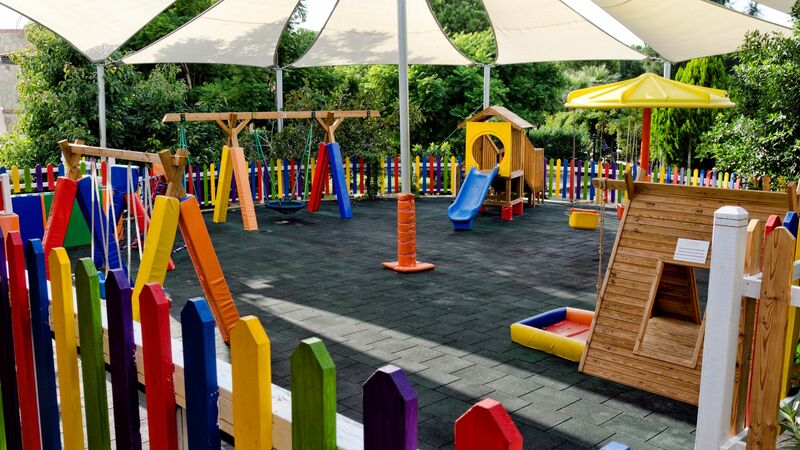 Children can indulge in a jungle-themed indoor and outdoor play centre shared with the sister hotel Gloria Serenity Resort, suitable for ages up to 14 years. Ages: 1 to 14 years (children under 5 years must be supervised by an adult). Indulge, relax and rejuvenate within 800 square metres of the La Source Spa, which includes Turkish baths, sauna and steam baths. Select from facials, massages and body rituals, including aromatherapy and shiatsu, or pamper yourself with a beauty treatment or new hair style. 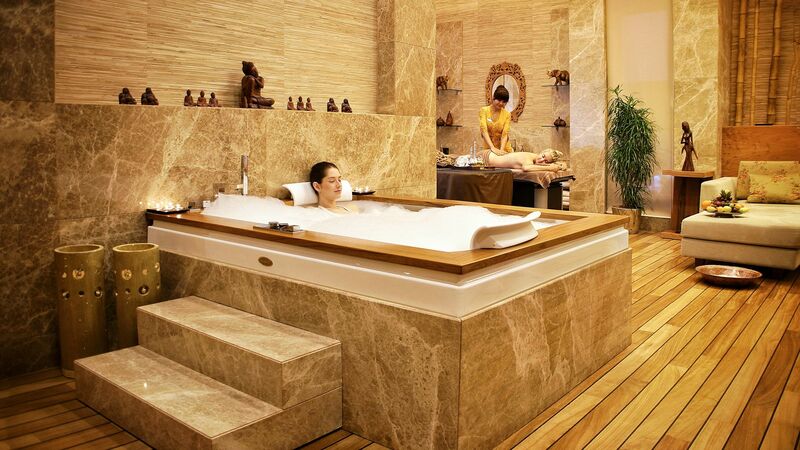 Children under age 16 are not permitted to use the Turkish baths, sauna, steam bath or pool. 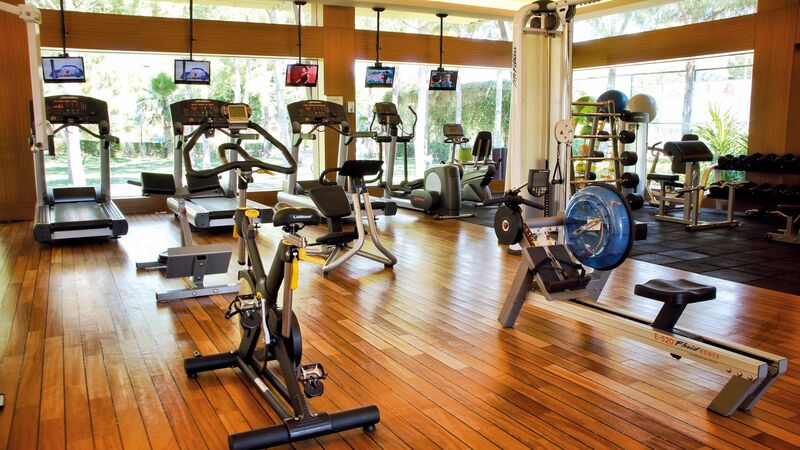 The fully-equipped Fit Gloria gym features the latest machines, expert trainers and exercise programmes and classes, as you look out at the resort’s beautiful gardens and nature. Visit the Entertainment centre and have fun playing billiards and PlayStation™ or head to the cinema and watch the latest movies. Those wishing to engage in more active pursuits will enjoy the numerous activities on offer, including Zumba, Pilates, Yoga, Table tennis and more. Four tennis courts, two of them floodlit, as well as mini football pitch are also available. 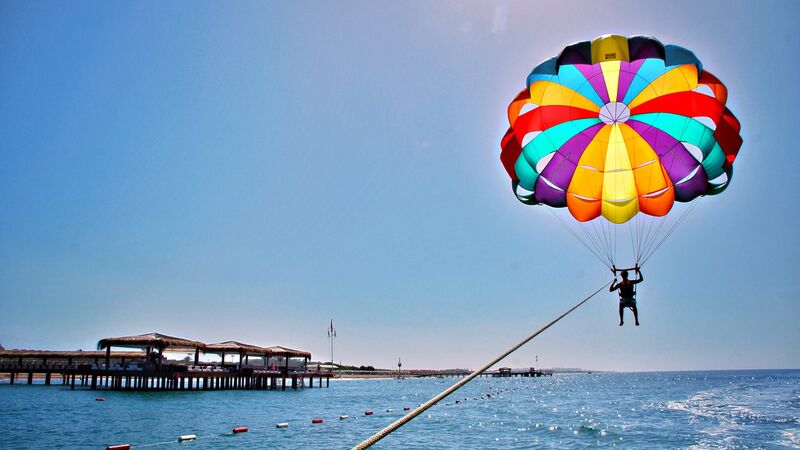 To make the most of the blue sea, try some of the resort's watersports, including catamaran, banana boats, parasailing or water skiing, alternatively test your skills in the surf club. 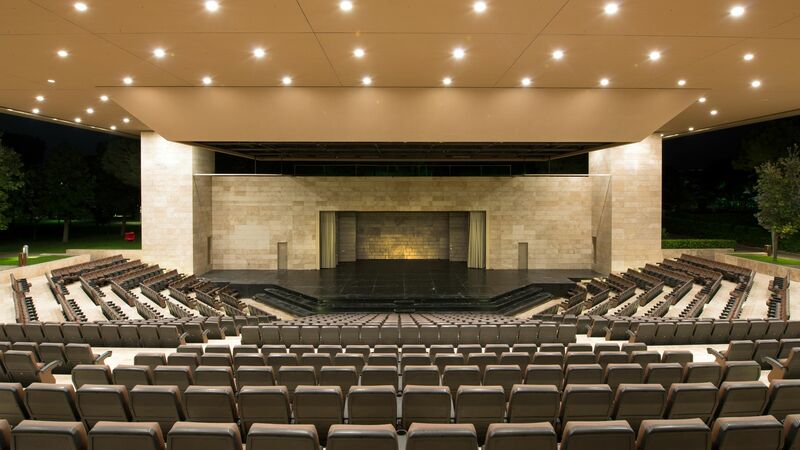 Equipped with a special sound and light system, the Arena Amphitheatre is a home to theatrical performances, dance shows and even circus performances throughout the year. 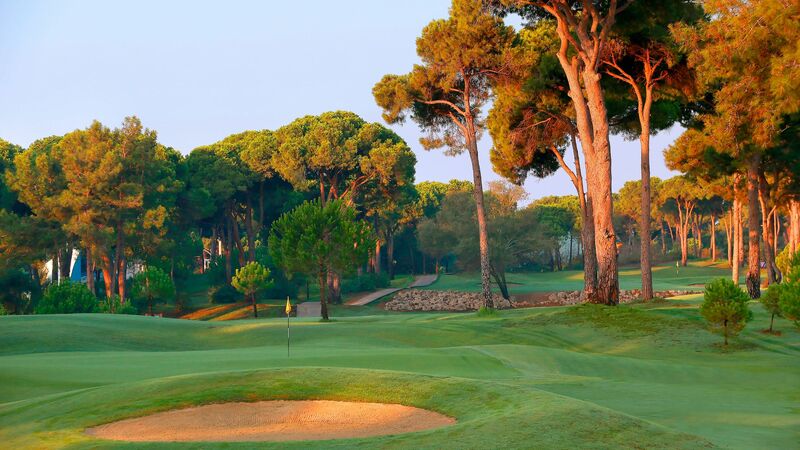 Designed by architect Michael Gayon, the Gloria Golf Club is the largest golf course in Turkey, with two 18-hole championship courses and a 9-hole Verde nestled within the pine trees and lakes. Guests can also check out the driving range, golf academy and club house. 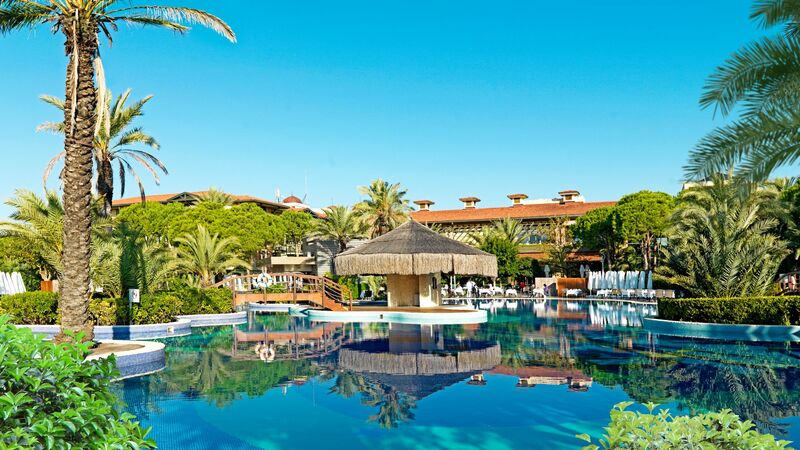 Gloria Golf Resort is 45 minutes from Antalya Airport. These rooms are located in the gardens of the hotel and include a French bed or twin beds, sitting area, a balcony or terrace and a bathtub in the bathroom. These rooms are located in the main building of the hotel and include a French bed or twin beds, sitting area, balcony or terrace and a shower in the bathroom. Junior Suites are open plan with a French bed and lounge area. Junior Suites feature either a balcony or terrace and the bathroom has either a bathtub or shower. Suites are located in the main building and have one bedroom and a separate lounge area. The Suite has either a balcony or terrace and the bathroom features a shower. Gloria Family Suites have two bedrooms, two bathrooms (one with a bathtub and one with a shower) and either a balcony or terrace with garden or pool views. Villas have a large sitting room, two bedrooms (one with a French bed and one with twin beds), each with either a balcony or terrace, two bathrooms (one with a bathtub and one with a shower) and garden views. Save up to 15% discount on the hotel price for holidays between 01 April - 31 October 2019, booked by 31 March 2019. Golf offer available at this hotel, please call our Trusted Advisers for further details. Beautiful clean hotel, fantastic food and friendly staff that provide a great service. Pool area, water park and hotel beach area well looked after. 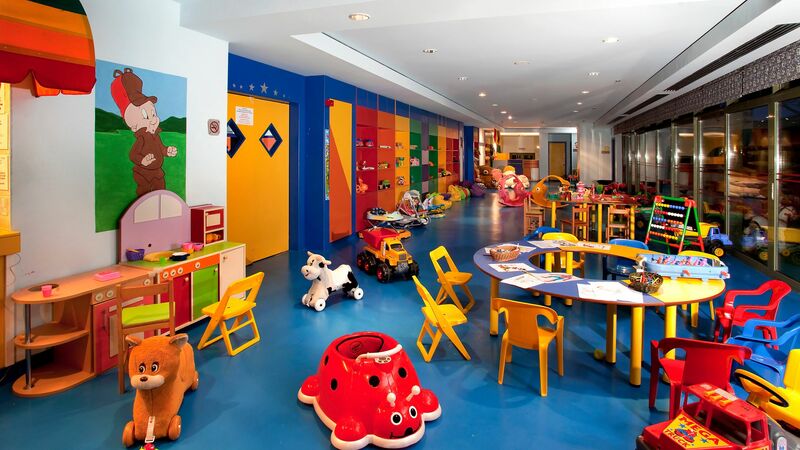 Kids club safe and friendly. Lots of entertainment in the evening with the sports bar, games room, amphitheater and stage area on the beach. Visited twice in one year for family holiday and was impressed both times. Nice relaxing break and overall a great holiday. Hotel is spotlessly clean everywhere you go. Staff all really helpful and professional throughout the hotel. We thought the food was also excellent in the main restaurant and also tried the three a la carte restaurants , Spanish, Italian and Harem (no cover charge for this, you just have to book at guest services). Great to go for a walk to the other hotels including the Serenity and the Verde where you can also buy food and drink at 50% of the cost. Enjoyed the bands in the Gloria Caf?? in the evening, thanks to Baykutay. Special mention to Zubeyir who made us laugh everyday of our holiday, brilliant personality within the entertainment team. A few negatives to mention, no air-conditioning at this time of year (April) so rooms were very uncomfortable to sleep in, the hotel did provide a fan but didn?? ?t help much, also warm in the bar areas too. As it is still classed as early in the season a lot of the grounds were still being prepared around the gardens and beach areas. Also not many daytime activities yet as this doesn?? ?t start until another 2 weeks when there will be Boccia, water polo etc , seems to be catering more for golfing guests and convention guests at this time of year. Our first visit to Belex to play golf and relax and we are already arranging our next trip. The standard of the hotel, the quality of food and drinks and most importantly the hard work all the staff put into making sure we had a great vacation was noticeable from the time we arrived to the day we left. Thank you to all the wonderful staff through the hotel who do make this hotel a very special place to be... they also are keen to look after and promote kindness to all the aspects of wildlife and nature around the hotel. There a a few cats which are well looked after by the hotel who also have a donation box to assist with their health and care. Keep up the good work.. See you all again. David and Amanda UK Stayed April 2019. Just returned from a fabulous weeks golf in Belek. 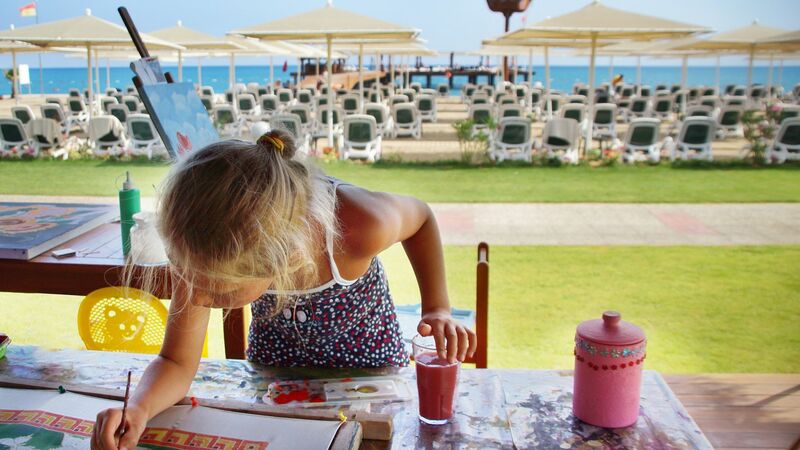 We stayed at the Gloria golf resort for the first time having stayed at a number of hotels in Belek in the past. We tried here because of other reviews, and we were not disappointed. This is the best hotel we have stayed at over the 10 years we have been playing Golf in Belek. 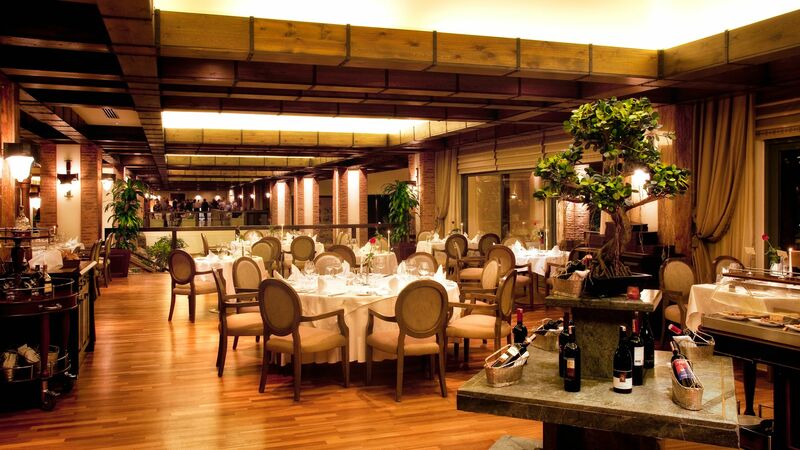 The food was of exceptional quality, especially in the alacarte restaurants. The friendliness and service from all the staff was exceptional as well, from the maids right up to the senior staff. Nothing was a problem. We have already made enquiries for returning next year.